Jason Clarke takes over the role of Louis, a loving husband and doting dad to two children who moves his family to an old home on fifty acres of land after accepting a physician’s job at a local University. When Church, the pet cat, is killed by one of many trucks speeding past their home on a consistent basis, his new neighbor, Jud (John Lithgow), guides him to an area beyond the local pet cemetery that brings life back to the cat — but with a cost. Many know what happens after that, but for those who don’t, I won’t spoil it. All I will say is this is where Kölsch and Widmyer deviate the most form the source material. When I first learned they were doing it, I wasn’t a fan. Since you aren’t supposed to judge a book by its cover, I kept an open mind, and upon seeing how all of the pieces were fitting together, accepting the change wasn’t as hard as I thought it would be. Unlike much of the cast of the original film, everyone involved in the updated version is perfectly cast, especially Jeté Laurence as Louis’s daughter, Ellie. Each one is talented enough to know what type of film they’re making, so instead of performances that chew the scenery or are as wooden as petrified bark, we’re treated to honest emotion that showcases the depth of joy, pain, fear and regret that each character must endure throughout the film based on each of their sometimes sordid backstories. And then there’s Church the cat. I applaud Kölsch and Widmyer for choosing to use a real cat instead of relying on CGI to make it work. Back in January, A Dog’s Way Home used a computer-generated mountain lion that completely ripped you from the supposed emotion it was trying to garner from its bond with the title’s canine. 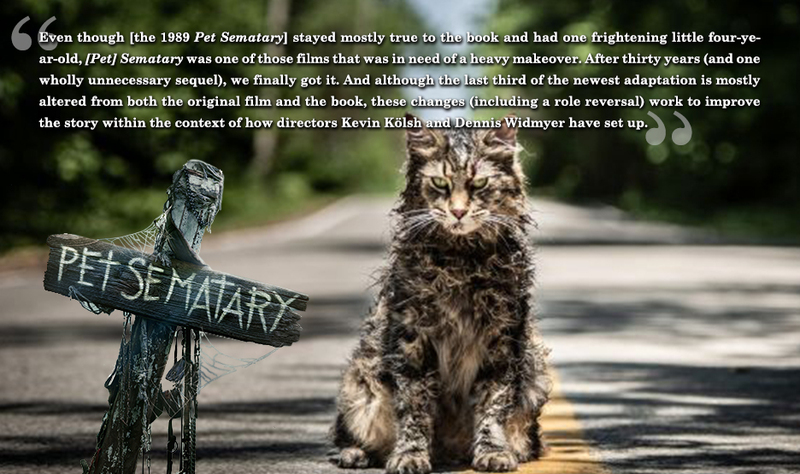 Using a fake cat in Sematary to heighten each case of demonic behavior would definitely have been noticeable and would have made the overall film feel fake as well. By creating these moments with a real cat, it allowed to keep a lot of what the cat does subtle, and thus much more frightening. And that’s what Kölsch and Widmyer do well throughout the film. A lot of the original film felt phony because it was so exaggerated. Here, we get a nice, serene backdrop within a looming atmosphere of danger and mysticism. Kölsch and Widmyer create a reality for their characters and stay true to the rules they set up very early on in the film. One example is in how they keep everything lit in a darker manner, as opposed to being so well-lit, you’d think you were in a romantic comedy. A lot of the scenes in the original film are shot during the day, which makes those scenes at the cemeteries seem a little off. In the updated film, these same scenes happen at night, which makes what happens more believable and chilling. There are still a few things I’m not sure make much sense within the context of the film, but that’s mostly King’s fault. This includes the disturbing backstory of Louis’s wife, Rachel (Amy Seimetz), who inadvertently killed her ailing sister when she was younger and has never quite recovered. In both versions of the film, it doesn’t seem this story line really goes anywhere or does anything for the story except add in a few jump scares, some very creepy visuals, and provide a reason to regret something from her past, adding a juxtaposition to how Louis deals with the idea of death. At the same time, those scenes are also done incredibly well, filmed in a way that add to the sense of despair and regret, and make the characters feel human and relatable. There’s no way to perfectly adapt any book to the screen, but when you show respect for the source material while making it your own, that’s when real magic happens. And even though Kölsch and Widmyer make some very glaring deviations from the original text, they prove that there can be a synergy between both film and book that make for one terrific experience. Next week, new movies include Hellboy, Missing Link, Little and After. If you would like to see a review for one of these, or any other film out next week, please respond in the comments below. This entry was posted on April 7, 2019, 3:31 pm and is filed under Entertainment, Film, Movies, Reviews. You can follow any responses to this entry through RSS 2.0. You can leave a response, or trackback from your own site.